It was at the end of 2015, Casinoland was launched, a true promise for the future. Being online for a few months, this online gambling portal starts to become more active and attractive, and it doesn’t come as a surprise that this NetEnt Casino is already pretty popular with players and this is just the beginning. Besides a super attractive welcome package, including four deposit bonuses altogether worth €/£/$ 800 or 8000kr, Casinoland is offering players great regular promotions as well. Today, for example, you will be awarded an amazing 50 Free Spins for the Koi Princess™ slot, a NetEnt slot with more slot features in it than any other video slot. Before I am going to tell you all about the Tuesday Spotlight Special, available at Casinoland today, I would like to tell you more about this promising online casino that was launched last year in several languages including English, Swedish, and Norwegian. 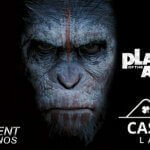 With this Casinoland is showing that it has only one goal which is to become one of the biggest in the world. Players from Australia, Canada, New Zealand, and the UK can look forward to a separate platform in their local currency. The same goes for Norwegians and the Swedish who even got a platform in their own language of which I know it is much appreciated by Nordic players. Every single country having its own platform can expect some of the local landmarks used by Casinoland while the International page has been kept universal. The English players, for example, get their beloved Big Ben and English Bulldog while the Australian players can look forward to a koala of which I now know they are also related to the kangaroo, another symbol of Australia. It doesn’t matter if an Aussie, Kiwi, British, Nordic, European or whatever nationality, I’m sure you will enjoy Casinoland as this gambling platform is operated by a group of iGaming enthusiasts that are as passionate about online gaming as yu are. Assuming you landed on this page while being on a quest for a reliable online casino while being able to comply with your wishes, there is a good chance Casinoland is indeed what you’re looking for. Although new on the market, I know this NetEnt Casino is as trustable as any other brand available on Netentcasinos.com. Not only does Casinoland has only one goal in mind, to become the “go to” brand for those who know their casino gaming, they also have over a decade worth of experience in the iGaming industry. It is because of this that Casinoland understands what it takes to deliver an exciting, enjoyable online casino experience that is refreshing, reliable and secure. I, on the other hand, I’m having seven years of experience reviewing online casinos and it didn’t take me long to see that Casinoland is having the potential to become one of the biggest. From their huge array of premium online casino games, an outstanding mobile offering, a wide range of deposit and withdraw options, and a professional support team, I can see Casinoland wants all players to feel right at home while providing them the best online casino and mobile casino experience possible. Being fully responsive means that Casinoland is accessible to you from any device and from any location as long as you are connected to the internet. Of course, you only have access to the entire games suite when entering Casinoland from a PC or laptop. When you open Casinoland from a mobile device, you’ll automatically be directed to their mobile platform including all NetEnt Touch® Games. 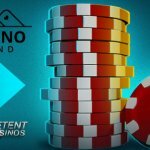 Casinoland is a unique brand that is bring together online casino games from a wide variety of the world’s top gaming developers including the entire NetEnt Games suite. It is because of a comprehensive selection of game suppliers Casinoland is able to deliver a total of over 700 of the very best online casino games. Among these 700+ games you’ll also find premium table games like Blackjack, Roulette and video poker, as well as progressive jackpot slots such as Mega Fortune™ and Hall of Gods™, popular video slots like Starburst ™ and Guns N’ Roses™, and classic slots. Casinoland is also showing off with its unbeatable “Live Dealer” games giving you a chance to enjoy an authentic casino experience with real dealers. Another good reason why Casinoland is highly recommended can be found on the ‘Promotions’ page showing a fabulous welcome bonus package. This welcome package makes you realise that you don’t have to worry about casino bonuses and other NetEnt Casino promotions. It all starts with a total of four first deposit bonuses with the first one to be awarded straight after you’ve topped up your brand new Casinoland account for the first time. This first deposit bonus involves a 100% welcome bonus going up to €200. This maximum bonus amount can be collected three times more linked to a second welcome bonus of 50%, a third welcome bonus of 25% while Casinoland will be adding 25% extra to your fourth deposit. 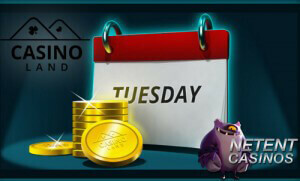 This means a total of €/£/$ 800 or 8000kr can be collected when you become a new player at Casinoland. Besides a very lucrative welcome bonus package, you can also look forward to regular casino promotions such as Free Spins Promotions and more. Today is reserved for a Free Spins Promotion which means a deposit is enough to activate an incredible amount of free spins for the Koi Princess™ slot. Top up your casino account with at least €/£/$ 50 or 500kr and Casinoland will award an amazing 50 free spins for one of the most dynamic video slots available in any online casino. The Koi Princess™ slot is highly recommended if you are a big fan of slot features as this NetEnt slot is the most feature-packed slot ever made. Having an Asian theme, you’ll be transferred to a place far from home, perfect for a relaxing break. Koi Princess™ is a dynamic video slot with Random Features enabled for 1 spin, exciting Bonus Features, and a Bonus Bet mode. I’m sure you’ll be on the edge of your seat as Random Features can appear unexpectedly during any spin in the main game. Three Bonus symbols appearing in the main game will activate one of the four amazing Bonus Features: Sure Win Free Spins, Wild Reels Free Spins, Coin Win and the Bonus Wheel. So make sure you don’t miss out on today’s Free Spins Promotion at Casinoland.